Following the Empire's exhausting finale this week—Yes Boo Boo Kitty slept with ____ and yes, ____ caught them—you can now buy a piece of Cookie Lyon's cat-print-filled wardrobe for yourself. You too can "taste these cookies," if you will. I ranked the items for your viewing and, perhaps, buying pleasure, if you're flush enough to cop Givenchy. Cookie's costumes are currently for sale on Look Live at several price points; baller, mid-range and the rest of us. Let's take a look, shall we? 10. Here's Cookie's Kenneth Cole Gemini chiffon mixed-print blouse, which I hated then during "The Devil Quotes Scripture" and now, ugh. Don't buy this, please. 9. Here's Cookie's French Connection Viven color block jersey dress from "The Outspoken King" episode, where she tries to play nice and help out on a video shoot… before baring her claws later. This look is OK and the mid-range price point is solid for a good office, job interview or afternoon museum-opening dress. 8. This Torn by Ronny Kobo Morgan dress is one of my favorite looks on Cookie from the entire season—the design hugs her curves and I love the colors on her skin. I'm thinking about buying it, stashing it away and then dusting it off in October as the best Halloween costume ever. Who'll sell me the fur and big ring? 7. Wait—maybe this Balmain diamant zebra stripe maxidress is actually my favorite Cookie look from Empire's first season? She is a ruler surveying her queendom. 6. Behold Cookie's debut outfit, an animal print Diane von Furstenberg Arianna dress with a matching coat. The complimenting gold fingernails, belt, bracelet and earrings are unfortunately not for sale. Que horror! 5. The green-and-black Gucci Fall 2009 sequin dress from "The Devil Quotes Scripture," in which Cookie read Anika/Boo Boo Kitty at the family dinner table during prayer, like a fantastic villain. 4. Here's the Roberto Cavalli animal-print dress, paired with a spectacular beige fur coat, which Cookie wore in the pilot episode as she busted in on her ex-husband Lucious Lyon's important business meeting—the first of many grand interruptions. 3. The Alexander McQueen long floral bodycon dress from "Sins Of The Father." I loved this one because it screams spring even though it's snowing here in New York City. The lowest-priced Neiman Marcus option isn't bad either. 2. Givenchy sequin print jersey dress from "Sins of the Father," which Cookie wore when she declared bipolar disorder to be a white person's disease until she learned that, you know, we all have mental issues no matter our ethnicity. Great, but who wears sequins to a mental hospital? 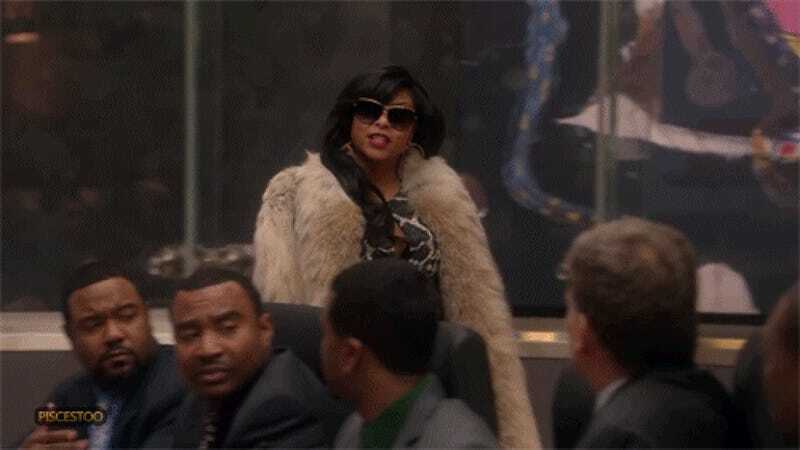 Cookie Lyon, that's who. 1. Cookie's purple fur that is not for sale at all, but man, don't you need this in your closet? I do guys, I do.